Do I have bugs under my skin? Many people who are itchy experience a crawling sensation and wonder if they have bugs under their skin. While lots of insects like mosquitoes, fleas, spiders, and mites seem to take great delight in biting us, there are very, very few bugs that can actually live under our skin, and even more fortunately, very few of these bugs can be found in North America. There are some very exotic ones from other parts of the world, but I’ve personally only seen one patient with one of these exotic infections. Scabies mites live out their entire life cycle in and on our skin. It burrows under our skin and lays eggs that hatch in about a week and become adults that live about a month. Scabies can only live for a day or two off the human body. Typically, there are very few adults present at one time on an infected human-usually just about 10. If you have scabies, expect to be itchier than you ever thought possible. Actually, expect to be itchier than that. Most people have incredibly severe itching from head to toe that is even worse at night. The itching comes from an allergic response to the mite that develops a few weeks after the initial infection. The infection is highly contagious, but easily treated with a highly effective topical medication. 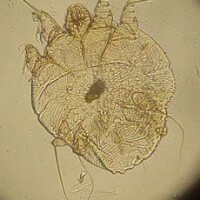 However, even once the mites are killed, some patients remain itchy for weeks to months. This mite lives in hair follicles and feeds on oil and skin. They are probably a normal organism on our skin and ordinarily do not cause any symptoms. Demodex are difficult, if not impossible, to get rid of. There are treatments that reduce their numbers, but they usually come back. 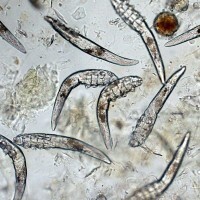 There has been a long standing hypothesis that demodex mites may underlie some cases of rosacea. I’ve had some patients improve with treatment of demodex-usually they have more severe rosacea to begin with and have lots of pustules that are filled with demodex. Outside of North America there are a few other bugs that can live under our skin. The only one that I have ever seen in a patient is the human botfly. These flies live in Central and South America. The adult lays eggs in our skin that hatch into larvae that are about 1/2 inch long. The typical story is a patient who develops several very painful boils a week or two after coming back from Costa Rica or someplace like that. There are websites that claim that two other bugs, Collembola (springtails) and Strepsiptera (twisted-winged parasites) live in our skin, but there is no credible evidence of this and no verifiable cases of human infestation. There is a publication from 2004, but the images in it were faked using Photoshop. There are a ton of different kinds of flies that feed on human blood. Their bite usually leaves very itchy, red, raised bumps that are like hives or welts. They are capable of transmitting some diseases (HIV is NOT one of them), but none of these insects can live in or reproduce in our skin. Lice are wingless insects that cannot fly or jump. When they bite, they can leave intensely itchy pink bumps. There are a great many different types of lice, but they are super picky in that each type of louse is only able to live on one type of host, meaning that dog lice cannot live on people, human lice cannot live on dogs, etc. There are 3 types of human lice- the human head louse (Pediculus humanus capitis), body louse (Pediculus humanus humanus), and crab or pubic louse (Pthiris pubis). Human lice must feed every 24 hours or else they starve to death. Head and pubic lice lay their eggs on our hair and the eggs can often be found cemented to the hair. Insecticide shampoos can wipe them out, but meticulous combing of the hair with special combs that will remove all the eggs also works. Shaving off all the hair also works. Body lice lay their eggs in clothing and are only seen in people who wear the same clothes for extended periods of time without changing. In North America lice do not transmit any diseases, but in other parts of the world they can transmit typhus. Fleas dine on blood and may feed on birds, pets, livestock and humans. They travel by jumping and can live for extended periods of times without a meal. There are cat fleas, rat fleas, etc, but most of them will also bite humans if their preferred host is nowhere to be found. Lice and scabies, the most common parasites that plague people, are picked up by direct contact – such as sharing brushes, hats or clothing. Lice (unfortunately rather common during the school season) can be treated at home with over-the-counter treatments or by meticulous nit-combing, but scabies should be confirmed by a physician and treatment will require a prescription. If you do go on an exotic vacation, launder your clothes thoroughly when you get back. To prevent fleas, treat pets with a flea and tick treatment such as Frontline. Chemical treatment of the home (e.g. a flea bomb) may be necessary for significant flea problems.